The fully loaded 2013 Lexus GS 350 is second only to the brand’s LS flagship in premium appointments, and yet can deliver spirited handling when called upon to perform. Even without the F-Sport enhancements available in most of the brand’s line-up, this year’s model of the GS 350 can still rally its 306 horses into a deeply satisfying stampede via Sport Plus mode, whenever the open road beckons and the spirit moves the driver. When navigating the convoluted canyons of the urban jungle, the 2013 Lexus GS 350 is a mobile oasis of comfort and technology, with personalized input unprecedented in an automobile at this price point. The GS 350 incorporates Lexus design cues like the spindle grille and the sweeping lines of the aerodynamically sculptured body, along with dual chrome rectangular exhausts cleverly tucked into the rear fascia. Additionally, LED running lights at front and rear, along with 9-spoke alloy wheels give the 2013 Lexus a distinct and distinguished image. This is not an easy task in a era when wind tunnel studies to lessen drag tend to carve vehicles into optimal shapes, blurring many of the former distinctions between automotive brands. Lexus’ introduction of the spindle grille has made it as immediately recognizable as the three-pointed star, interlocked rings and sunglass-shaped grille of the brand’s European competitors in the premium niche. The top premium level includes 18-inch alloy wheels sporting all season radials, that elegantly complimented the Liquid Platinum finish of the test model. The centerpiece of the 2013 Lexus GS 350’s interior is the optional 12.8-inch HD widescreen display, that gives two thirds of the information display to the GPS navigation map and the rest to audio, climate or other data windows, all selected and controlled via relatively intuitive voice commands. The rest of the interior is a comfortable and well-planned redefinition of the traditional Lexus level of luxury. The front seats feature perforated leather for three levels of cooling as well as heating with 13-way power adjustments, which includes four-way lumbar support – an intrinsic aspect of comfortable seating. Leather is also wrapped about the steering wheel, which is also heated in the full luxury model, and the gear selector. A power moonroof graces the headliner, adding the occasional element of nature into this cocoon of mobile comfort. Soft ambient white light illuminates storage compartments and controls at night, easing access to life’s many accessories. Safety in the 2013Lexus GS 350 begins before you even enter the car thanks to the Smart Access key that unlocks the door as you walk up. When you exit the vehicle, it is quickly secured by tapping the dimple on the exterior handle. Thus, the key remains snug in pocket or purse, and never gets misplaced. Once inside, occupants are protected at all times by the advanced airbag system, as well as numerous technical marvels. These include auto-dimming sideview mirrors that keeps headlamp glare from vehicles in adjacent lanes from blinding you on the highway. The blind spot sensor gives an alert day or night if another vehicle is nearby, but not in the line of vision. Of course, there’s a rearview camera and parking assistance, but it’s passive, only kicking in if activated. Dependable tracking, stability and traction are assured by the usual array of high-tech systems and management, including the 2013 Lexus GS 350’s active torque control all wheel drive. Bi-Xenon headlamps are self-washing and rain-sensing wipers de-ice themselves. At this level of premium automobiles, Safety Connect automatic collision notification is a given, along with stolen vehicle location, SOS call button and one year of roadside assistance. An added level of technology and personalization comes in the form of Lexus Insider. When a new owner first begins to drive the 2013 Lexus GS 350, the navigator screen will display a message stating a Lexus Insider Message awaits attention. It will go away when the owner proceeds to whatever business put them in the driver’s seat, but the message will remain until time permits its examination. The message will take the owner on a tour of 17 features of the GS 350 than can be tweaked to suit personal preferences. An owner can also elect to have the features demonstrated by a Lexus professional during the initial 6-month/5,000 miles service appointment. There are another 21 aspects only the dealer can set, including whether or not the driver’s seat slides back to enhance egress when you stop the engine, whether the alarm button will sound at all – disturbing everyone nearby except the cops who know only owners ever set these off by accident – and so on. The Insurance Institute for Highway Safety has rated the 2013 Lexus GS 350 Good for moderate overlap frontal impacts, side impacts and roof strength, though no small overlap tests have been performed as yet. It is rated at 6 of 10 for CO2 output plus 5 of 10 on smog emissions, and estimated at 19-mpg city and 26-mpg highway by the EPA. Annual fuel costs are gauged to be about $2,700. The GS 350 comes with the 3.5-liter aluminum block 24-valve DOHC V6 engine with direct and port injection, featuring electronic throttle control with intelligence, standard. It has a zero-to-60 speed of 6 seconds in the active torque all-wheel-drive model and a top track speed of 131 mph (141 in the rear wheel drive model). On the road, the 2013 Lexus GS 350 has four different performance personas selectable by the driver to suit conditions and personal mood at any given time, enhanced by Eco, Sport and Sport Plus modes. ECO mode pulls in the horns of the sports sedan to produce a more demure essence characterized by a restrained throttle and softened suspension. Normal mode provides a balanced combination of performance and comfort, befitting the brand’s position among the luxury automakers. When a more spirited dynamic is desired, Sport mode delivers the power of the direct injected V6 with more aggressive throttle response and stiffened suspension for an exhilarating example of what the six-speed sequential transmission can do with all those horses. Sports Plus mode brings the steering wheel’s paddle shifters into play, for those testing how much performance can pulled from the engine, transmission and suspension through sheer skill and determination. 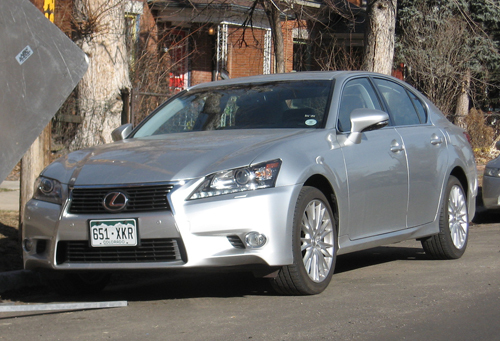 The 2013 Lexus GS 350 has a base price of $49,450 and the fully loaded model driven had a final price of $61,212 including destination and handling fees. That puts it in direct competition with the Mercedes E-class with a base of which starts at $51,000 with a 270-hp V6 engine and 4matic all wheel drive. Also in the same neighborhood is the BMW 535i xDrive with 300 horses, all wheel drive and a base price of $55,700. Finally, the Audi A6 with the 3.0T engine has 310 hp, mileage ratings of 18/28/22 and a base price of $42,200 (with the smaller 2-liter engine and front wheel drive). We suspect the 2013 Lexus GS 350 is the better buy for many, though at a certain point it all comes down to personal taste. With the same level of equipment, the Audi might slightly outperform the Lexus and some might prefer its styling, however the end price could be a bit more and you won’t find the same level of luxury in the Audi as the Lexus. If you have any of these vehicles in mind, we recommend a spin in the Lexus GS 350 before you buy.